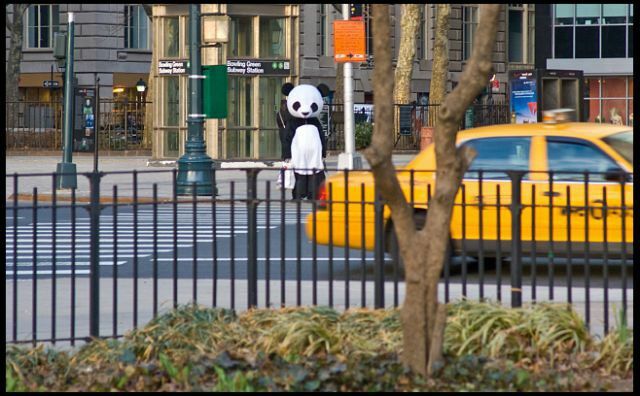 Gothamist was intrigued by the Sad Panda seen walking around Manhattan. DCist couldn't help but notice that the Obamas' plan to give away tickets to the White House Easter Egg Roll entirely online didn't go so well. Londonist discussed the 'what', 'why', 'who' and 'where' of the protests surrounding the forthcoming G20 summit. Chicagoist mourned the decision to cancel the city's annual South Side Irish Parade in 2010 (and potentially move it to the suburbs) after revelers got too out of hand at this year's parade. Torontoist called out Earth Hour—in its second year there—for the event's ridiculously hypocritical sponsors (Coca-Cola! ), banal tie-ins (alcohol drinks named "Carbon Footprint"!) and, ultimately, its sad tokenism. Shanghaiist acted as a fact checker for the AFP over that whole "Youtube got great firewalled" thing. LAist found out about what some people have dubbed the "Ghetto Bird Hotline"—it's the number you call to find out why an LAPD chopper is circling over your house for ages looking for who knows who or what. Bostonist armed our readers with information when we heard rumors about vampires at Boston Latin High School. We provided a guide to spotting vampires in your school and retold Boston's rich history of vampires. Seattlest jumped headfirst into that Euro kind of football, speculating on the staying power of Sounders FC popularity and the heritage of their Real Salt Lake rivals. SFist survived a swarm of zombies.